Tennant Creek based sisters and CDU students Rebecca (left) and Cherrie-Lee Healy couldn’t be closer. Rebecca and Cherrie-Lee Healy have plenty in common. The sisters live in the same town, work together, and also study together. Employed by the Northern Territory Government’s Department of Business and Employment, the sisters assist people from Tennant Creek, and across the Barkly region, to register and start their own businesses. 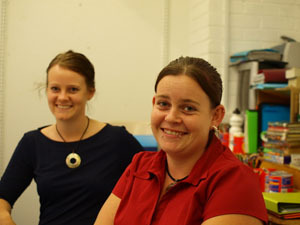 Both are students at Charles Darwin University (CDU) and apply their new-found knowledge to the workplace. Rebecca Healy has just started a Bachelor of Laws at CDU and said the experience had given her confidence in her workplace, which often deals with legislation. “Studying law really opens up my mind because I am applying knowledge directly to my job,” she said. Rebecca started the degree as an external student after finishing her Diploma in Business last year and said it was an exciting new challenge. “It’s been a big commitment, but I’ve made some great contacts with other students studying across the country,” she said. Supervising younger sister and trainee Cherrie-Lee also keeps her busy during the day. Cherrie-Lee is completing her Certificate III in Business and said she enjoyed learning in tandem with her sister. “Rebecca and I make a great pair because we are always bouncing ideas off each other,” she said. But working with your sister does have its disadvantages. “You can’t chuck a sickie,” she said with a laugh.